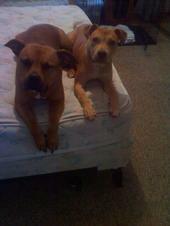 Avery and Abby My Sweet Babies R.I.P. Avery was 4 years old and Abby was a year old. Avery and I have been through so much together. She was always there for me. Avery loved taking baths, playing ball and cuddling with me and Abby. Abby was full of energy. She loved playing rope/ball, playing with Avery and spending time with Mommy. I moved and left them with my ex because he loved them as much as I do. Well, he ran into some trouble and his mother wasn't able to take care of them. I worked out homes for them, but it was too late. My ex's mother had the pound pick them up and they weren't there for 2 hours before they were put down. I was heartbroken. I am in the works on becoming an advocate for pit bulls. They were my children, my heart and now I have lost them.